Edward Tufte, whose books I call the Kama Sutra of information design, spoke at Stanford one December evening, and I had the pleasure of being in attendance. It was an unconventional talk, as academic lectures go, for Tufte was speaking “in the first person” about his own life: his origins in rural Nebraska, his education and formative years, his mentors who influenced his thinking, and the turning points that signaled moments of profound reorientation. As Tufte noted, for a sample size of N=1, the estimated variance is infinite; so other sources should be consulted. 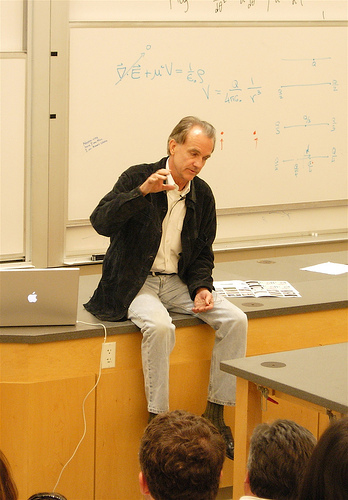 Edward Tufte at Stanford, 2006. Photo by Daniel Steinbock. Tufte has had a remarkable career and speaks as someone who appears to have found the courage to follow his bliss, leaving a tenured professorship at Yale to self-publish his famous books on visual information, go on speaking tours, and make large-scale landscape art in his Connecticut backyard. There were three principles I took away from his talk, summarizing Tufte’s notion of a life well-lived. In whatever one’s work, be not only a great communicator of ideas and practices, be an exemplar of those same practices and this will communicate the value of what you are saying far better than anything else. Tufte’s books are not only superb treatises on the visual display of information, they are also exemplary demonstrations of clear visual communication. I call them the Kama Sutra of information design. Here again, Tufte is, as he presents it, self-exemplifying. While utopian cultures may be unattainable, you can pretty well approximate an ideal life through clarity of purpose, courage to act on that purpose, and, most importantly, doing what you love. Tufte opened his talk with a poem, excerpted from T. S. Eliot’s Four Quartets. I’ll leave it to you to interpret what he meant by it.